Graduation Cap and Gown, Academic Regalia and Doctoral Regalia such as the doctoral gown, doctoral tam, PhD gown, Master's Gown and Bachelors Gown & Hood . 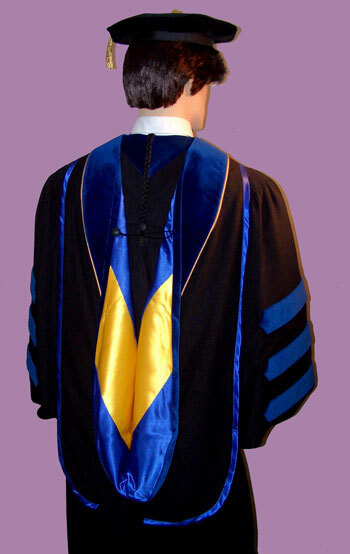 At Graduation Cap and Gowns .com, we specialize academic regalia for faculty members and graduating students, such as bachelor's caps and gowns and academic hoods. 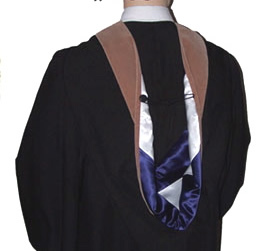 The academic hood is comprised of a fabric shell (usually black), "degree velvet" and "school lining". 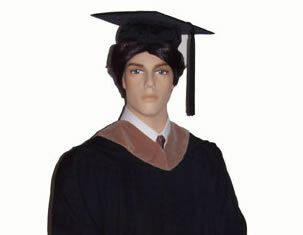 The velvet of the bachelors hood represents your degree. As each hood is custom-made according to your school colors, degree colors, and type of degree (BA, MA, or PhD), we ask that you give us about +/- 8 weeks to process your order, especially during the graduation season. What if you don't have that much time to wait? No problem -- ask us about our free loaner hood program! Loaner Needed? If your academic hood isn't going to be ready by the date requested above, would you like us to send you a generic loaner hood at no charge that you will return upon receipt of your actual hood. For orders within USA we accept checks and/or most credit cards. For international orders, we may require more information. If paying by credit card, please do not include credit card number in email. Instead include a telephone number on your email where we can call you back.